As Seen on TV! By Friday, 10pm EDT anyway. Like every diehard Supes fan, I watched the original Sonicsgate doc with a mixture of pride and heartbreak. I could only watch it in 20-minute segments, if only to keep myself from punching my monitor or sending Tourette’s-like streams of expletives to Howard Schultz’s corporate email account. "Yes, Mom, the painting will be on TV. No, no, I won't be on TV. Just the painting I did. No, they're not going to talk to me. Because nobody cares what I have to say, I'm an artist. Sigh, yes, I will come over and help you set your VHS." Anyway, said painting is conveniently now (soon?) available in the all-new SUPERSONICSOULSTORE on the Zazzle. Also, some of my other SSS “Hall of Fame” images are included in the Sonicsgate DVD Bonus Features. Dammit, did I bury the lede? That’s what I get for being a journalism school dropout. Losing the Sonics was the worst thing to happen to me since losing Griffey. 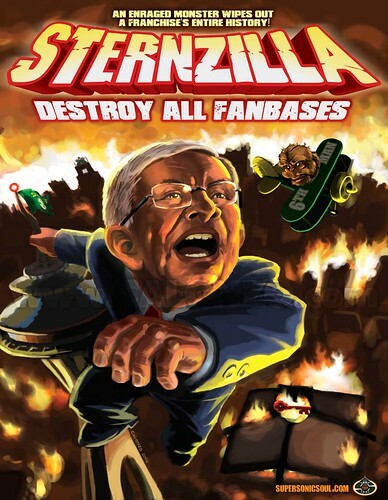 As far as re watching the travesty again I'm not sure I can, ever since the day it was announced they were going to OKC David Stern has become my mortal enemy. The only chance he ever has for me and him to be on good terms again is if he steals some other city's team and gives them to us, but even then I think at best I would just want to be his acquaintance. I still can't believe that we lost our team to OKC. I am in the same boat you are, watching Sonicsgate is such a bummer. I just want my team back. I love the painting by the way. BOOOOO Stern.